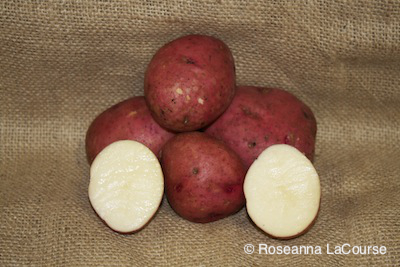 A beautiful potato with smooth, thick, red skin and white flesh, having wonderful boiling and baking qualities. Stores well, maintaining good skin color. Bulks up quickly, so it's good for early new potatoes. Resistant to hollow heart; moderately resistant to scab. Expect few lavender flowers on these large spreading plants.